Maserati has always been known for producing striking GT cars with fantastic power plants. 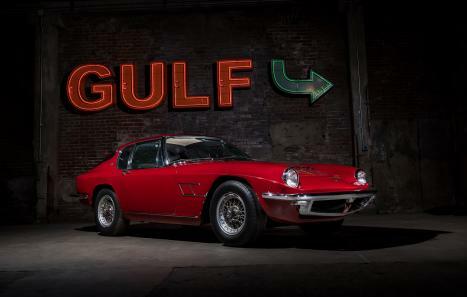 When the Mistral was introduced in 1963, it was yet another notch in the Italian car maker’s belt. Named after the strong blowing winds from the Mediterranean coast in the south of France, the aluminum Frua bodied Mistral is often considered one of Maserati’s most beautiful GT cars. 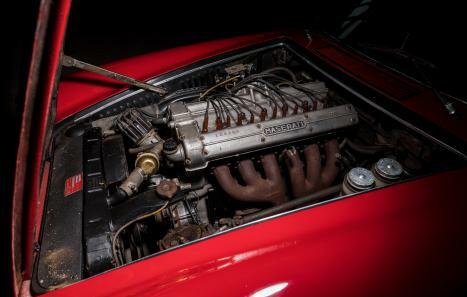 Initially powered by a 3.5 liter “Casa del Tridente” twin spark, double overhead cam straight six engine, the displacement would grow twice more throughout the Mistrals life time to the final most powerful and desirable 4.0 liter version which produced 255 bhp at 5200. The car was offered in both a spyder and coupe version through its 7 year production run. Other than the addition of larger power plants, and the offering of a steel body after 1967, the Mistral remained largely unchanged until its production ended in 1970. Throughout the 7 year production run, approximately 800 cars were built in total. This particular Maserati Mistral coupe, chassis number AM109/AI*1476* and engine number AM109/A1*1476*, is a 1967 model year fitted with the highly desirable 4.0 liter twin spark, double overhead cam straight six engine. 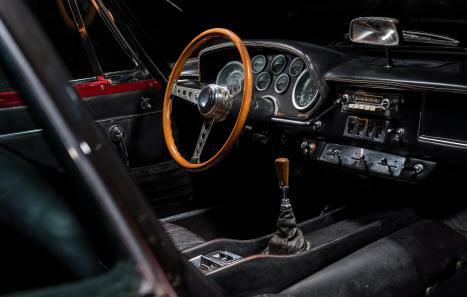 According to the included Certificate of Authenticity this matching numbers car was manufactured in October of 1967 and was finished in the the same “Rosso Cordoba” (Dark Red, Salchi code 106R7) over Black Connolly leather (code PAC. 1560) that it currently wears today. This particular example was ordered new by Foreign Car City Inc. of West Nyack, New York and invoiced on October 23, 1967. At the time of ordering it was fitted with factory-optioned power windows and a radio antenna. Not only is it a desirable 4.0L example but it is also one of a small amount produced with an all-alloy body. Early history is largely unknown but it was recently purchased out of long term storage in Michigan, where it was last titled in 2009. The car is complete including the original Lucas fuel-injection system, air-box and correct date-coded knock-off style Borrani wire wheels. The car is said to have had one older repaint and the interior is believed to be largely original. The odometer currently shows 19,302 miles but the true mileage is unknown. This car would be deemed a project as it does not currently run and certainly has cosmetic needs but the engine does turn freely by hand and the car is complete. There are a few different directions that can be taken with this example in its current condition- Service the car mechanically to make it a driver as-is or undertake a full restoration to bring it to concours condition. Included with the sale of the car are numerous spare parts, a spare wheel, and the certificate of authenticity.